Standing tall and proud in the churchyard of St. Nicholas Church, Hurst, Berkshire is a monument to the bravery of village soldiers in two World Wars. Though visible from the road, the war memorial rarely attracts attention except as the centrepiece for the Remembrance Sunday service. 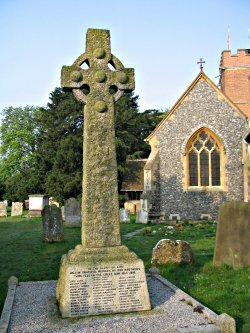 The twelve feet high celtic cross in rough hewn granite was built as a fitting tribute to the men who gave their lives in the Great War; the 'war to end all wars'. Twenty years later that aspiration faded with the start of the Second World War and a new inscription was added to commemorate the soldiers who fell in that conflict. The war memorial was unveiled in 1919 and dedicated by Rev. Edmund Broome. The west face of its rectangular plinth originally held thirty-four names, with six more being added later. These forty men fought in the major engagements of the war, from Mons in August 1914 through to the Armistice in November 1918, and died as far from home as Gallipoli, Italy and Greece. One third of the men have no known grave and all three services are represented: Army, Navy and Air Force. The inscription on the east face of the plinth includes the names of twenty six men who fell in the Second World War. They fought in Europe, Africa, India and the Far East, giving their lives from the retreat to Dunkirk in 1940 through to Allied victory in 1945. Together these sixty-six young men, predominantly in their twenties, represented the lifeblood of the village for two generations and their loss was keenly felt. A few were regular soldiers but most were volunteers. They went to war enthusiastically, proud to do their patriotic duty, and stoically endured the horrors and hardships of total war. They will forever deserve our thanks, our respect and most of all our remembrance.